Heat oven to 325°F. Spray bottom and sides of 13x9-inch (3-quart) glass baking dish with cooking spray. In large bowl, beat 4 whole eggs, 1 egg yolk and 3/4 cup granulated sugar with wire whisk until well blended. Beat in milk, whipping cream, vanilla and 1 teaspoon cinnamon until well blended. Stir in apples and 7 cups of the bread pieces. Let stand 20 minutes. Pour apple mixture into baking dish. Lightly press remaining 3 cups bread pieces on top of mixture in baking dish. Brush top of bread with melted butter. In small bowl, mix 2 tablespoons granulated sugar and 1/2 teaspoon cinnamon; sprinkle over top. Bake 55 to 65 minutes or until top is puffed and light golden brown (center will jiggle slightly). Cool 30 minutes. In 1-quart saucepan, heat sauce ingredients to boiling over high heat, stirring constantly, just until butter is melted and sauce is hot. 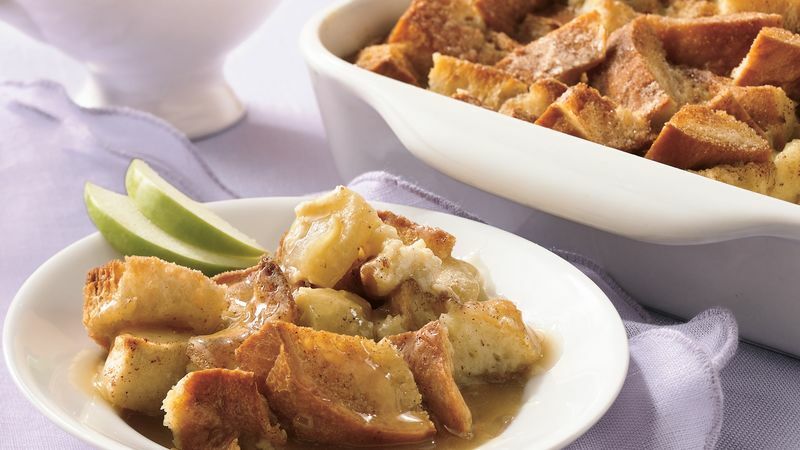 Serve warm bread pudding with sauce. Using bread that is a day or two old is best; it will be firmer and drier than fresh bread. Bread that is too fresh and soft will give you a bread pudding that is too moist and soggy. If you like, skip making the sauce and top with caramel topping instead. Though it’s humble in appearance, there’s nothing ho-hum about the rich taste and custardy texture of bread pudding. It’s a dessert that has a long history and a proliferation of varieties in America and throughout the world, but this apple-studded version is an ideal choice for a cozy fall dessert. It’s made from scratch, but can be prepped in just 25 minutes — and 20 of those minutes are hands-off, when you let the egg mixture soak into the bread and apples. While the apple bread pudding is baking in the oven, you’ll have plenty of time to prepare the decadent finishing touch, a buttery caramel sauce. Serve up the warm pudding with a generous drizzle and you’ll impress everyone at the table. Especially when fall rolls around, we can’t get enough of apple bread recipes like this, which make the whole house smell sweet and scrumptious. For the best results, whatever kind of apple treat you’re making, brush up on our time-tested advice on how to bake with apples.